UK road safety and breakdown organisation GEM Motoring Assist has pledged its support to the #dontstreamanddrive initiative. Taking place today (April 16th), Don’t Stream and Drive Day represents a reminder to all motorists concerning the dangers of using handheld mobile phones at the wheel. Across the UK, there is a growing trend for drivers to stream their journeys live from their mobile phones. However, this practice is highly dangerous and needs to be stamped out. GEM road safety officer Neil Worth believes anyone who does this should be taken off the roads immediately, as they potentially represent a significant risk to themselves and others. 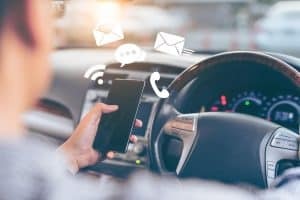 Mr Worth concluded that drivers can miss important information when they aren’t focused on the road, while also being unable to maintain constant speed and a safe road position. The #dontstreamanddrive initiative is being spearheaded by former police officer Neil Dewson-Smyth and is being promoted across social media. It aims to highlight the dangers of mobile phone use and why distraction can be such a deadly risk for drivers.